The OPERA & VISION model louvered roof Pergola® systems can be fitted with remote controlled LED mood lighting RGB strips and also spot lights. The LED strips are available for the perimiter of the system and can be multi colored or white only. You can have the system automatically change the color periodically, or keep it one color. The white spot lights can be added to the actual louvered strips where desired. 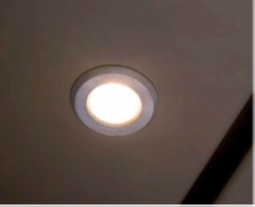 The lights are dimmable to the desired brightness. 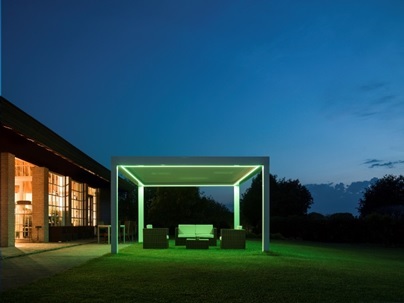 Our optional LED lighting are a wonderful addition to your Louvered Pergola® structure. They are simple to operate with a remote control. The perimeter strip LED lighting can be set to change colors automatically, or set to display one color. Your Louvered Pergola system really is not complete without this wonderful feature. 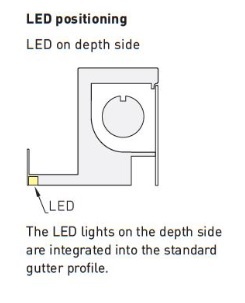 The “perimeter” LED light strips are also neatly integrated into the aluminum gutter system or structure for a modern and clean look. 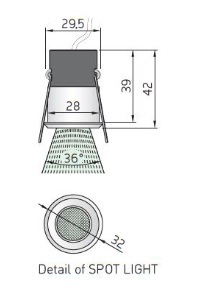 The spot lights are integrated into the individual metal louvers. 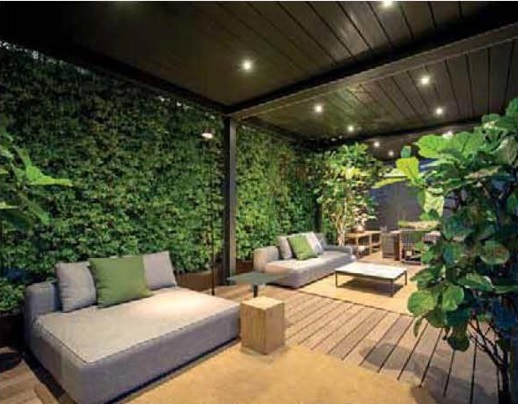 You can integrate both LED lighting systems onto your Pergola® or just one. What you choose will depend on your preference or needs. The LED spot lights can be used in evening when the louvers are closed, while the perimeter multi colored strips can be used whether the louvers are closed or open, as they are fixed to the perimeter gutter system. For restaurants, the lighting can be used in evenings to illuminate the interior for creating a mood and for safety lighting when the patio closes for the night. If you wish to create your own “Martini Bar” feel and atmosphere, you can do so with the “Blue” Led strips. Our louvered Pergola® structures are sure to be the talk of the town at your favorite restaurant or bar, or in your own backyard oasis for your friends and family.